Coming home from work last Thursday exhausted, I felt the weight of the past month of travel and busyness resting on my neck. Suddenly the doorbell rang. An unexpected visitor. My niece Emily stopped by and we went to dinner. The weight lifted. What I thought mattered, really didn’t anymore. On Friday, I went to a friend’s brother’s funeral service. Family and friends gathered to remember and grieve. The priest noted someone once said that coincidence is God’s way of remaining anonymous. Puts a new perspective on how we are a part of “coincidences” every day. 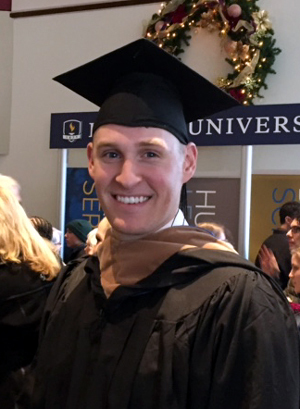 On Saturday, my nephew Mark earned his MBA while working full-time. We celebrated his hard work and diligence. You can feel the joy on his face and it’s well deserved. The degree is an accomplishment, but who this young man is becoming as a person is much more important. A bright and purpose-filled future. Whether a surprise visit, a graduation or a funeral, sacred moments surround us longing to be noticed, honored and taken in. We have 20/20 vision when it comes to problems and irritations, yet somehow we are blind to the gifts and blessings that remain faithful and ever present. God’s ringing the door bell, crying with us at the funeral, cheering our victories as we foster and grow the gifts that He bestowed on each one of us. When we recognize, witness, fully participate and emerge ourselves in these moments, we show the gratitude and awe that is owed. As we enter this most holy and sacred week, may we see with new eyes, hear with uncanny clarity and let the spirit that is born at Christmas enter our very being all year long, each day, each sacred moment.